Introducing Mineral Store – one of the many traders that you will find at this year’s Gem and Jewellery festival on 2-3 March at Bracken Ridge State High. Tony and Jude Forsyth’s site is one of the best places to check if you are into collecting mineral specimens. Tony has been collecting minerals and fossils since he was 8 years old. After more than 20 years on the management committee of the Queensland Mineralogical Society Tony’s work was recognised in 2017 with the award of an Order of Australia.. Tony is also the curator of the Heritage Minerals Museum’s extensive mineral display in the Queensland Museum at South Bank.Tony will be displaying and selling minerals and crystals from all around the world, having been to Germany and USA in the last year to source material.. Check out his web page at http://www.mineralstore.com.au/ and catch up with Tony in the outdoor trading show at our gem and jewellery festival. 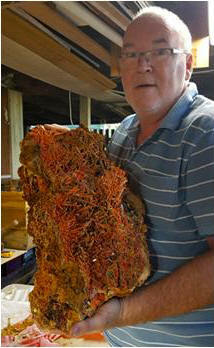 Tony Forsyth OAM with a large Crocoite specimen from Adelaide Mine Tasmania.